You’ve heard of The Dictionary Project and its mission to distribute dictionaries to all third graders. But now you wonder how it all works. Well you will be glad to know that The Dictionary Project provides Sponsor Resources that takes away the guesswork.. Included in the Resources are letters of explanation for the schools and parents, book-plate labels, a How-To Manual, a PR Kit and many presentation ideas. They also provide a variety of dictionaries, thesaurus and other reference books including a Sampler Kit you can order. It is important to understand that the sponsor (either an individual or an organization) makes a monetary donation to The Dictionary Project and volunteers to distribute the dictionaries to the students as a gift. The Dictionary Project does not sell dictionaries. Click here to read the Frequently Asked Questions. Why 3rd graders? The teachers I’ve spoken with tell us that third grade is where students start to learn how to use resources (like dictionaries) and begin writing friendly letters. It’s a perfect time for a child to get a gift that will last a lifetime. As The Dictionary Project puts it: 3rd grade is where students move from learning to read to reading to learn. Consider where you will give the dictionaries – students in public and private schools benefit greatly from the gift of a dictionary but there are other opportunities. Community cennters, non-traditional schools, YMCA’s, homework help/mentoring organizations are just a few places to think about. Home-schooled students can also benefit from a dictionary. Many home-schooled children register through the local school but when you are ready to distribute look for a place where they can gather together. Education level and social status are not true indicators that a family has its own dictionary or other reference material. And in many cases children in a family do not have their own dictionary. The children are very appreciative of this gift. Thank you letters are poignant, funny, inspiring. My favorite was the little girl I saw kiss her dictionary. I keep that close to my heart. A child with a dictionary has the key to imagination, creativity and communication. This builds self-worth, self-confidence and self-respect. So get involved – it’s easy and the rewards are incredible. Imagine a remote hospital hundreds of miles from population centers serving 600,000 of the poorest people in need of health care. Now imagine that hospital with very limited electricity or power outages every day. Imagine if you took your very sick child to this hospital and a doctor had to use a candle for the examination. Imagine if your child needed oxygen and there was no way to provide it. Isn’t it hard to imagine something like this? Thanks to a new effort by Power Up Gambia, the brainchild of Kathleen Hall, (see my earlier story A Powerful Journey of Hope) reports another stepping stone in its journey to supply solar power for Bansang Hospital in the Gambia. In December 2010 the installation of maintenance-free lead acid batteries replacements for the defective batteries powering the current solar system for the children’s unit ended years of limited electricity. With ongoing maintenance and support for the new battery bank, the children’s unit has returned to full functionality. Collaborating with the hospital staff and The Bansang Appeal, Power Up Gambia plans to install a comprehensive solar panel system similar to the ones recently installed at the Sulayman Jungkung General Hospital and the Somita Clinic which will supply electricity and running water for the entire hospital. This is the work of a dedicated, energized volunteer group committed to using the sustainable energy of the sun in an environmentally responsible way to light up the Gambia one health care facility at a time. . Enjoy this video about the project. We are so happy to have 25 winter hats for kids finished and ready for distribution in October. Here’s one that is just taking shape. 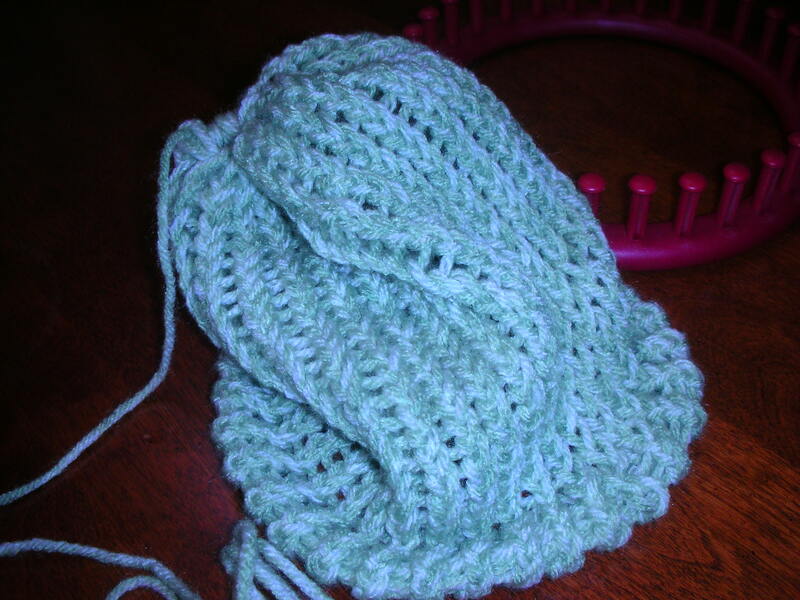 Made on a circular loom curiously called a Knifty Knitter it’s an easy-to-do project. 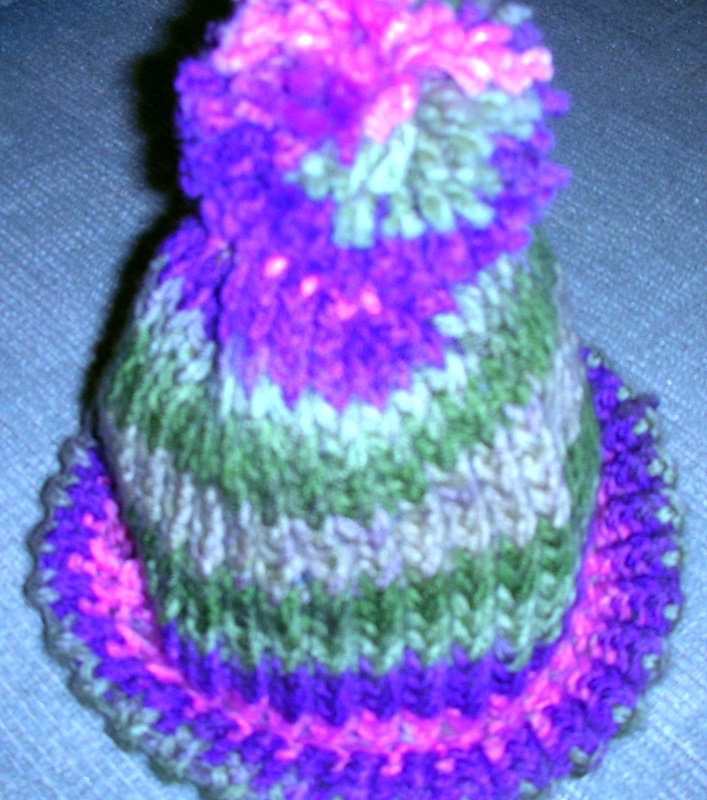 After a little practice it takes about 2 hours total time to make a toddler-sized hat and it is a great stress reliever as well. Knitting, crocheting and weaving requires paying attention to what you are doing so no multi-tasking here. Would you like to join us and stitch for a Noble Purpose?